Rotary headstall rack with 12 “J” hooks that are placed at a slight angle for easy access. 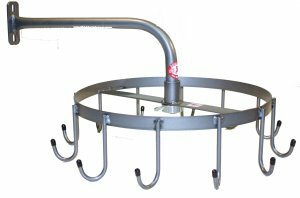 Perfect for storing a large number of lead ropes, halters, headstalls, reins or chaps. The full turning radius allows for maximum use space.